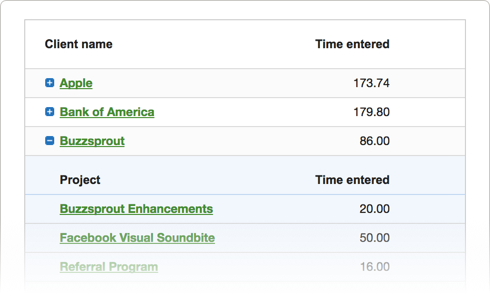 You'd expect time tracking software to give you a reporting tool, but time reports in Tick are more than just numbers. Every report is built around actionable data. Simple to create, simple to update and dig through, these reports make it easy to bill clients, or see any trouble spots in the project process so you can make adjustments before it's too late. Tick’s “by person” reporting gives you a time report of the hours each team member logged for that week, month, or custom time period. Select the "by client" reporting and you have a whole other way to look at the hours. Your high level view provides the big picture about where time has gone. To get more specific time report about a client or team member, Tick gives you the option to expand the view and get those too, without running another report or refreshing anything. Tick makes it easy to get a CSV file of your reports for invoicing through a third party accounting software. And if you use QuickBooks, Tick is integrated with their software to make the export/import even easier. QuickBooks for Windows Desktop is an accounting software that "helps you save time organizing your finances and paying employees so you can be more productive." Tick's integration with QuickBooks allows you export your time reports in a format that works seamlessly with your QuickBooks for Windows Desktop software.